For over a century copper tubing has ruled as king in the plumbing industry. Reliable, corrosion resistant, and bacteria deterring, copper has long been the go-to material for home plumbing systems. However, modern polymers have given us a new alternative material, PEX (cross-linked polyethylene), that is now rapidly becoming the favorite of modern plumbers since its introduction in the 1980s. Our company is not an exception, so if you live in Riverside, read about us and our services on http://riversideplumber24x7.com. PEX has several advantages over copper but the first and foremost of these is PEXs flexibility. As a plastic, PEX can bend around corners and through awkward spaces providing for easier installations and requiring less joining. This is beneficial because sharp right-angle joinings slow down the speed of water through a pipe, reducing water pressure. Additionally, joinings can be difficult to install, particularly in copper pipes which require soldering. This brings us to the next benefit of PEX, its cost. 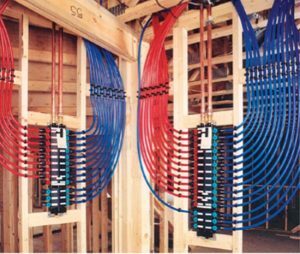 PEX piping is cheaper per foot than copper and the potential for cost savings is not only reflected in the price per foot. Due to the fact that PEX is more flexible and easier to install it cuts down the number of costly joins required and reduces the overall installation time. This means that while you are paying less per foot for PEX you are also getting a faster, and therefore less expensive, installation; great news for any homeowner from Riverside, CA. One more advantage of PEX is that while copper piping is famous for be noisy, PEX pipes are virtually silent, leading to a calmer and more relaxing household. Finally, for those living in colder climates, PEX can expand and contract much easier than copper, meaning that it is much less likely to break as your pipes freeze and thaw throughout the winter in Riverside. Lifehacker made a good comparison between PEX and Copper Piping recently. While PEX has made great strides in tubing materials there are some downsides. In particular, PEX piping has greater potential for bacterial growth than copper and PEX is sensitive to Ultra Violet rays. This means PEX should not be exposed to the sunlight for prolonged periods of time which can be sometime a problem in Riverside California. Additionally, PEX doesn’t have the long, proven, track record of copper piping. Also, as with any new technology, PEX installation runs the risk of encountering currently unknown, long-term, problems in the future. Copper tubing has served us well over the past hundred years, but with the introduction of the much cheaper and convenient PEX tubing it is time retire copper piping from our home plumbing systems and embrace the future: PEX. On the video below, you can see how to install pex pipe waterlines in your home.